In 2008, the Girl Scouts of Greater Atlanta was formed from the former councils of Girl Scouts of Northwest Georgia, Girl Scouts of Pine Valley, and Forsyth County (former Girl Scouts of Northeast Georgia Council). 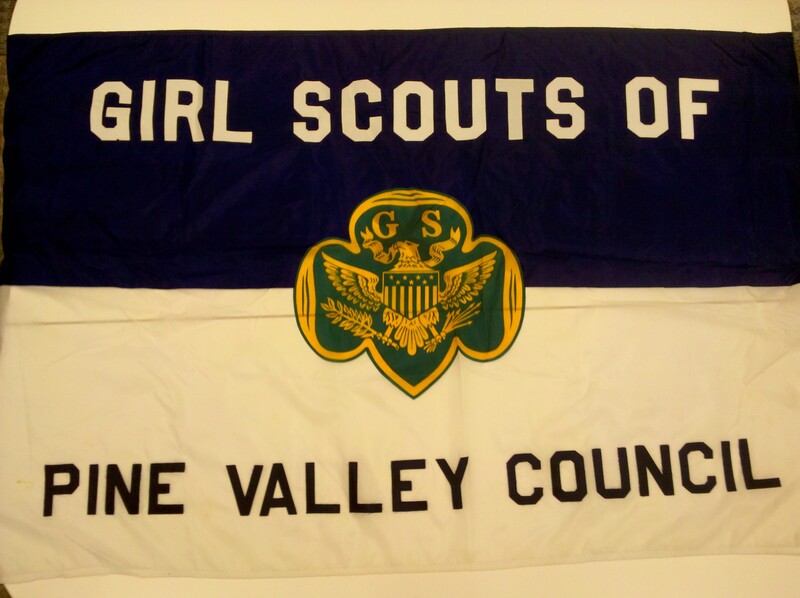 Girl Scouts of Pine Valley was originally comprised of Butts, Carroll, Coweta, Fayette, Haralson, Heard, Henry, Lamar, Meriwether, Pike, Spaulding, Troup, and Upson counties. During April and May 2011, the Council Archives received council records, photographs, uniforms, handbooks, pins, patches, troop scrapbooks, songbooks, videos, and more from the former Pine Valley Council office in Griffin, Georgia. Council staff have been carefully preserving records and artifacts from Pine Valley and ensuring that they are deposited into the Council Archives in Mableton, Georgia. 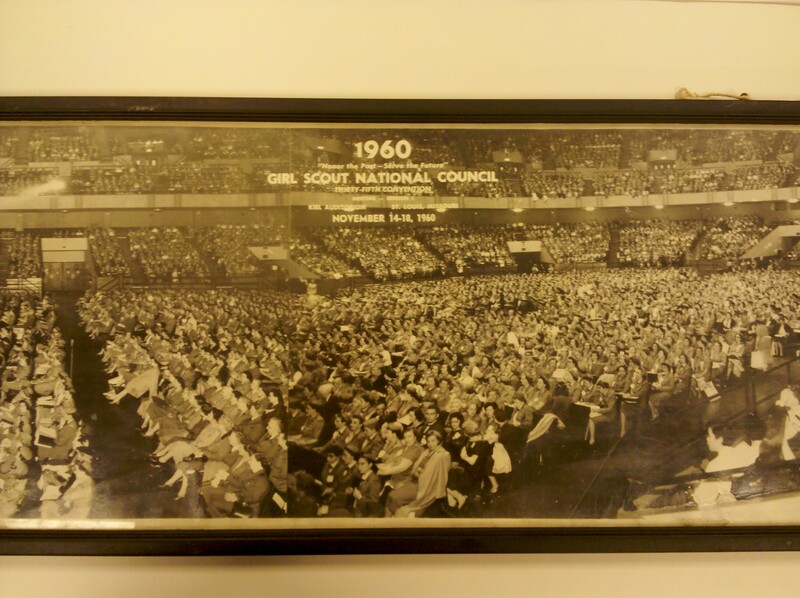 One interesting item from this collection is a panoramic picture taken at the 1960 Girl Scout National Council Convention, November 14-18, 1960 in St. Louis, Missouri. Held every three years, the 52nd Girl Scout National Convention is set for this coming November10-13, 2011, in Houston, Texas. The very first National Convention was held in 1915 in Washington, D.C., where the constitution and bylaws were adopted, and Juliette Gordon Low was elected National President of the Girl Scouts from 1915-1920. Among the uniforms we received was one dating from 1914. 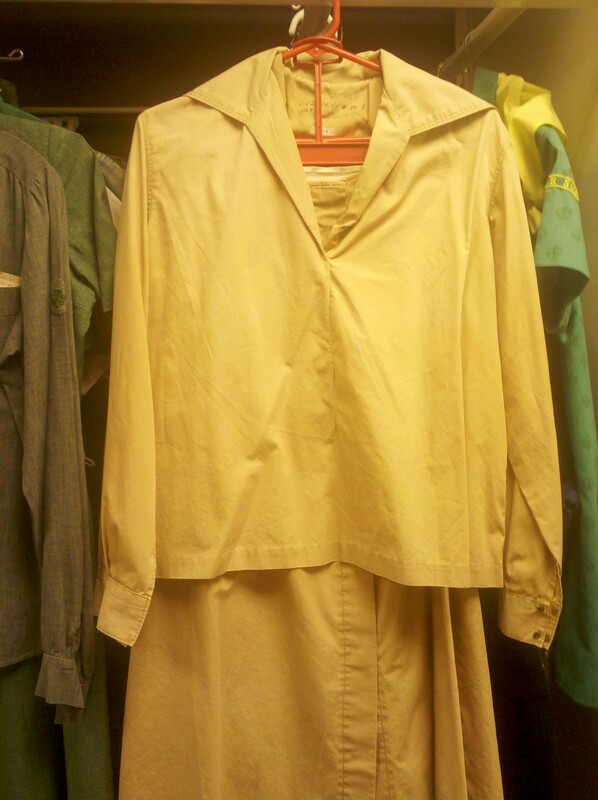 It is a homemade tan Intermediate (or “Junior” equivalent) uniform consisting of two pieces: one long-sleeved middy blouse and a skirt which is 32” long. (A middy blouse is a loose blouse with a sailor’s collar, worn by children and women). Another interesting uniform is a 1953-60 era Girl Mariner blue uniform. (The Mariners interest group was launched to give Senior Girl Scouts an opportunity to develop skills in boating, sailing, navigation, and water safety.) The hats in the collection included both girl and adult hats. The adult hats ranged in dates from 1948-1972, and a few of the girl hats included a dark brown Brownie beanie with an orange logo (used 1962-1993) and a Senior overseas hat with yellow cord and logo (used 1956-71). A few of the treasured handbooks we received included a Wing Scout Manual (used from 1949-1955), a 1938 Badge Handbook, and a 1939 Leaders’ Guide (used from 1939-1947). 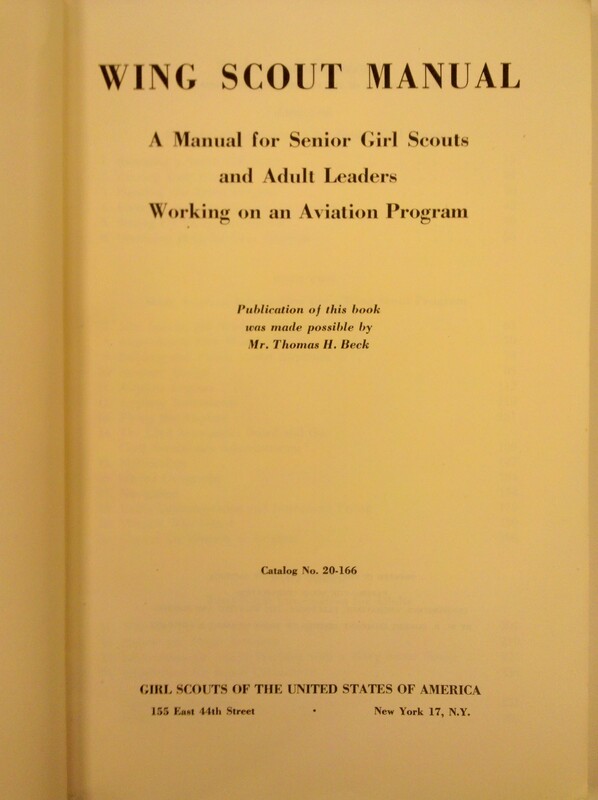 The Wing Scout program was a Senior Girl Scout program for girls interested in flying and wanting to serve their country, started in 1941 and ending in the 1970s. In July 1942, 29 troop leaders from fifteen states met in Philadelphia, Pennsylvania to take Wing Scout leadership training. These leaders returned to their councils and began setting up Wing Scout troops. In 1959, Girl Scout Council in North San Mateo County, California was presented with an offer from United Airlines San Francisco Management Club President J. L. Burnside to start an aviation program for Senior Girl Scouts. One of the highlights of the Wing Scout program was the courtesy flight provided to Senior Girl Scouts using United Airlines’ jets. For many of the girls, this was the first time they had flown in a plane. Senior Girl Scouts who had been in the program for three years were given the opportunity to take over the controls during flight in a small aircraft. The program was discontinued after United Airlines experienced financial setbacks in the 1970s. Posted on May 15, 2011, in Archives Acquisitions, Council History and tagged collection, convention, council, Pine Valley. Bookmark the permalink. 1 Comment. FYI Intermediate Girl Scouts began in 1938. Your tan uniform is for a Girl Scout. There was only one program level at that time. Love your site. I’ll be back.